Any chance of funding the St Trinian's (1952) model? On point as always Fiona. Thank you. 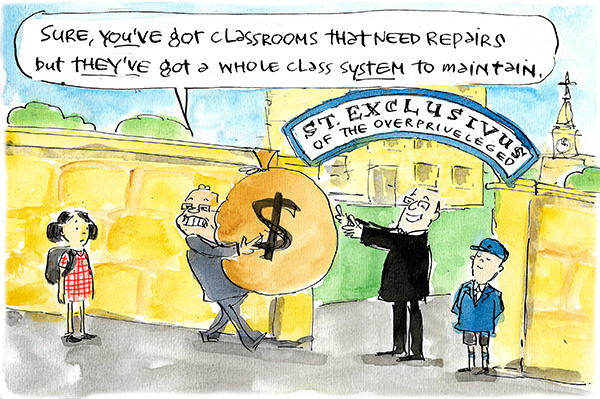 Parents of children at catholic schools subsidise the educational cost by approximately 25%. Governments, federal and state, would have to increase their educational budgets accordingly. It's in the interests of all tax payers to ensure that there is a viable alternative for parents to be able to exercise a real choice as to where their children are educated. Some parents choose to send their children to private schools. Is it really the responsibility or obligation of the state to subsidise that freedom of choice?